I am a millennial. In many ways, I am not a particularly exceptional one. Like many millennials, I delayed entering the work force (in my case through school) and got my first “real” full-time job at 27 and in the process acquired a massive student loan debt. I did not marry until I was 30. I have also been, in many ways, typically rootless. In my life I have lived in three different countries and three different states. In one way, though, I am an outlier. Fifty-nine percent of my generation who were raised in churches have dropped out. Many of them have become self-identified “nones”—that is, individuals who identify as having no religious affiliation when asked. This has often meant a drift towards “Eat, Pray, Love” style spirituality rather than sheer secularism, but the fact remains that a majority of millennials are leaving behind traditional religion. I, on the other hand, have moved into a more traditionalist religious affiliation than the one I was raised with. I am, of course, not alone in this. A quick Google search for Catholic or Orthodox conversion stories will find a whole host of millennials telling stories about how they left the non-denominational churches of their youth in search of something more rooted in history. Yet, the fact remains that we are a statistical minority. Catholics have lost more millennials than any other religious group. There are many reasons that it is bad that my peers are leaving the Church. From the perspective of traditional Christianity, it is bad for their souls. And, despite what many in the Western world now believe, the Church is a leaven for the good in society. The loss of even merely cultural Christian roots will have consequences. It has also already led to a loss of cultural and legal protections that support religious freedom. The mass abandonment of traditional religion by millennials is a source of existential dread for many in the Church—not only is there genuine concern for the souls of those who have left the Church, Church authorities fear for the very existence of the Church in the West. This has naturally led to a host of studies and think pieces aimed at understanding the millennial mind. Even the Vatican is getting in on the action and hosting a Synod on Young People this year. At the same time, the data aren’t necessarily as bad as they seem. The data suggest that the number of those actively involved in the Church has remained consistent. In America, regular church attendance has remained steady at about 30% of the population for the 40 years for which we have data.1 Those who have left the Church are usually those who in previous generations may have claimed a faith affiliation while otherwise having little or no active involvement in a church. There are more fundamental problems with the approach that many take to the millennial problem, however. First, the discourse around young people who leave the Church often does a very good job of ignoring those of us who have stayed. To be a loyal Churchgoing millennial can at times feel like being married to a spouse who keeps pining for their old girlfriend who cheated on them and abandoned them. I don’t think I’ve ever seen an article on the subject of millennials leaving the Church that has asked why those who stay stay. The assumption seems to be that we’re just millennials who haven’t left yet. The truth, however, is that we stay because we believe in what the Church is, despite her imperfections, and don’t want to see her try and doll herself up for those who have already abandoned her. We believe that the Church is God’s means for our salvation and have submitted ourselves to being formed by her. Of course, the Church, being full of sinful humans, doesn’t do a perfect job in her mission, but to assume that millennials who have left know better what she should be than those who have chosen to be formed by the Church is entirely backward. In saying this, there is the danger that we become like the older brother in the tale of the prodigal son, resenting the Church when she welcomes back those who have gone astray. We must be wary of this danger, but it does not justify selling away our birthright. Second, the approach to the problem tends to be one of marketing. It asks what the millennials who have left the Church want and how we can appeal to those desires. Glance at a sample of articles focused on why millennials are leaving the Church, especially at those written by millennials, and you will see a great deal of discussion about felt perception of the Church—“we feel we aren’t being listened to,” “we feel the Church is too hung up on the culture wars,” “we feel…,” “we feel…,” “we feel…” Feelings aren’t bad, of course, but it is a mistake to make them our lodestar. The truth taught by the Church is to be our lodestar. Our feelings are a faculty which must, like our conscience, be transformed in conformity with the truth. Well formed feelings are worth listening to. Unformed feelings are like waves tossed by the wind. As I wrote last week, the Church has her own identity which is not determined by majority whim. Furthermore, the things millennials say they want are often deeply misguided, even when they are grounded in Christian values. For example, one popular article claims that millennials are leaving the Church because “helping the poor isn’t a priority.” The author asks his readers to “clock the number of hours the average church-attender spends in ‘church-type’ activities” and then “clock the number of hours spent serving the least of these.” His conclusion is a simple “Oooooo, awkward.” The implication is that the Church clearly cares more about “churchy” things than service. The article suggests that if the Church wants to get millennials back it needs to “[s]top creating more Bible studies and Christian activity” and instead focus more energy on helping the poor. On the surface this may sound good. After all, the Bible is chock full of instructions to care for the poor. As Pope Francis never tires of reminding us, we are to be a Church for the poor. The problem, however, lies in pitting the Church’s teaching office (and presumably her sacramental ministry) against her care for the poor. For, while care for the poor is essential to the Church’s mission, her teaching and sacramental office is more important still. This can be clearly seen in Acts when the Apostles appointed the first deacons. The Apostles, who had been chosen by Jesus Himself to lead the Church, were asked to deal with an issue related to care for the poor. Their response to this was to appoint seven deacons to serve the poor because, “It is not right that we should give up preaching the word of God to serve tables” (Acts 6:2b). The Apostles understood that caring for the poor was necessary, but that the Church’s first mission in the world was the ministry of the word— that is, preaching and the sacraments. Any paradigm that tries to set the Church’s “Christian activity” against service is rooted in a fundamental misunderstanding of her mission. The marketing approach also fails because it is rooted in the felt perception of those marketed to rather than in reality. Take the above example. The author claims that the Church is failing millennials because she isn’t caring for the poor. Yet the truth is that religious institutions and those who have dedicated their lives to them are far more likely to engage in charitable giving and activity. Actively “[r]eligious people are far more charitable than nonreligious people.”4 For example, one study found that religious people are 25 percentage points more likely to give than secular people to give financially and 23 points more likely to volunteer. They also give 3.5 times more money and volunteer more than twice as often. Churches do a great deal of charitable ministry that goes unseen, especially if one is simply viewing the Church from the vantage point of wider cultural stereotypes and felt perception. Millennials in the Church who want to do good work for the poor have plenty of opportunities if they put in the effort, but alas it’s often easier to worry about the specks in other’s eyes than the planks in one’s own. Anecdotally, my experience has been that those I know who have left church claiming that it is because of things like the Church not caring for the poor rarely live lives of exemplary service. While some will throw themselves into charitable work, far more often they conform their lives to general secular patterns. They don’t give and they don’t volunteer, though they may occasionally hashtag. It is true that the Church needs to adapt, but she must do so in a way that is faithful to her identity and not marketed to millennials. Heck, having grown up in a world saturated with marketing, millennials are probably too market savvy to be won over that way anyway. Repeatedly in the modern world, we have seen that churches which try to adapt to the prevailing culture (and make no mistake those millennials who have left the Church are of the prevailing culture) inevitably die. I would argue that the answer to this problem is the Benedict Option. 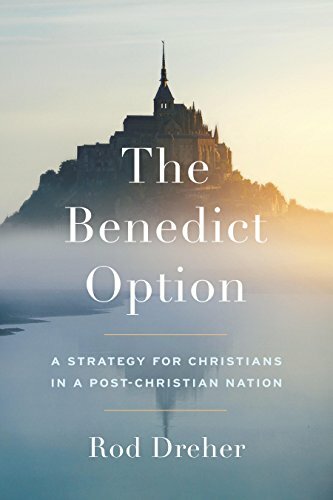 The Benedict Option, introduced by Rod Dreher and spelled out in his book of the same name, often gets misconstrued as a kind of fundamentalist withdrawal from society. In truth, Dreher argues that those in the Church need to accept that the Church has lost mainstream political and cultural power. Rather than withdrawing, however, we must build institutions that will allow us to thrive as a cultural minority. Two of Dreher’s primary examples of groups that have done this successfully are Orthodox Jews and Mormons. Neither group has withdrawn from cultural and political life, but they have found ways to build a distinct culture that thrives alongside the mainstream American one. It is time that orthodox Christians do the same. Such institutions will serve to support those millennials who have chosen to remain in the Church and will help them to raise families steeped in Christian culture. As the example of the Mormons indicates, such an endeavor does not entail abandoning evangelism or cultural and political engagement. It simply means reading the true signs of the times and acting accordingly to preserve what we value. Inevitably, a true Benedict Option Church will reach those millennials who can be reached and will engage them in a transformative relationship with Jesus Christ. As the Vatican proceeds with its 2018 Synod on Young People, I hope it will see its way to the necessity of the Benedict Option, rather than becoming seduced by the cultural accommodation that so many millennials say they want. I urge those at the Synod to let go of the centers of cultural power they have already lost and instead strive to build something truly beautiful and hospitable at the margins. Rodney Stark, Triumph of Faith: Why the World is More Religious than Ever, 189. Arthur C. Brooks, Who Really Cares: The Surprising Truth About Compassionate Conservatism, 34.